HUMAN Healthy Vending has launched the first website dedicated to the USDA's new "Smart Snacks in School" rules, which affect all schools participating in the National School Lunch Program. SmartSnacksInSchool.com (http://www.smartsnacksinschool.com) will be the ultimate resource for schools, nutrition professionals, parents, students and anyone interested in school nutrition. We want to help schools transition to USDA-compliant snacks in as seamless a way as possible. There is no need for schools to lose vending machine commissions or to have the headache of trying to figure this out on their own. 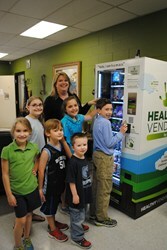 HUMAN Healthy Vending (http://www.healthyvending.com), a national, award-winning franchisor of healthy vending machine businesses, announces the launch of its site, SmartSnacksInSchool.com, the nation’s first and only website dedicated to assisting schools in complying with the USDA’s new competitive food rules called, "Smart Snacks in School." On June 27th, the USDA released its “Smart Snacks in School” rules, which affect the 100,000+ elementary, middle and high schools that accept assistance from the National School Lunch Program. “Smart Snacks in School” are a result of the Healthy Hunger-Free Kids Act of 2010, which set a deadline for the USDA to update its 1979 school snack standards. The “Smart Snacks in School” rules affect “competitive foods,” which are snacks sold in vending machines, a la carte lunch lines and in student stores, and set limits on the amount of calories, fats, sugar and sodium allowed in snacks, while requiring that snacks be predominantly made with dairy, whole grains, protein, fruits and/or vegetables. Acceptable beverages, under these rules, are limited to: water or carbonated water; unflavored low-fat milk; flavored or unflavored fat-free milk and soy alternatives; and 100% fruit or vegetable juice. Allowable portion sizes of juice and milk vary by grade. There are additional beverage options for high school students, including lower or calorie-free beverages, however, schools cannot sell regular-calorie sports drinks. Schools must comply with these rules by July 1, 2014. Guide and video to understanding the nutrient limits on competitive foods. 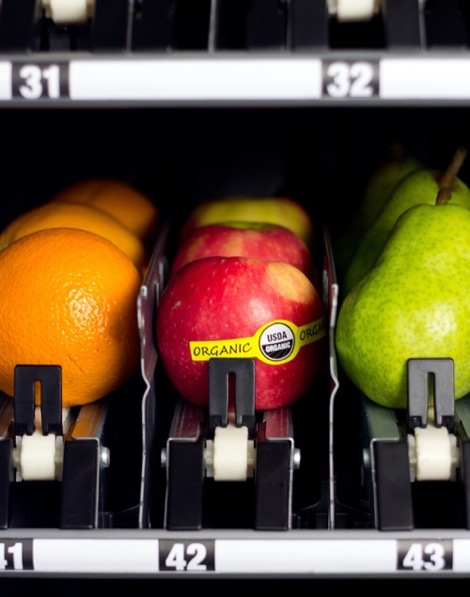 Guide and video with 5 easy steps to transitioning from your school’s current vending program to a healthy vending program. Guide and video with explanations as to why schools should act now, rather than wait until next year, to ensure compliance with Smart Snacks in School. Guide to Competitive Foods and Smart Snacks in School, which can be used as a handout. This guide breaks down Smart Snacks in School’s nutrient limits and rules in an easy-to-understand format. Guide to Smart Snacks in School Calculations. This guide gives you the formulas to assess whether a snack meets the nutrient limits. For more information on Smart Snacks in School, please visit SmartSnacksinSchool.com. For information on having healthy vending at a school location, please click “contact” on http://www.healthyvending.com or call 310.845.7745.